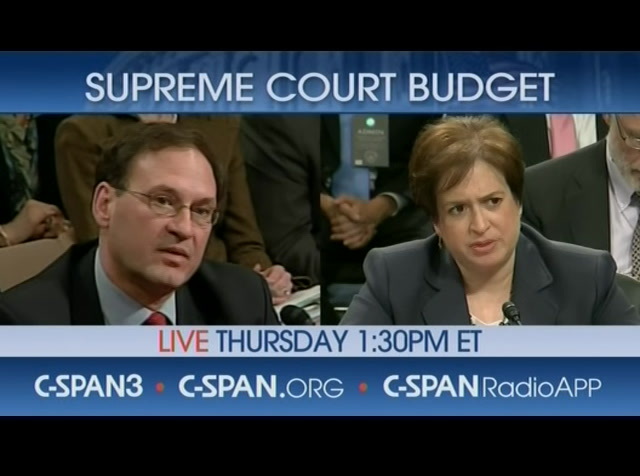 >> thursday supreme court justices samuel alito and elana kagan testify about the court's budget. 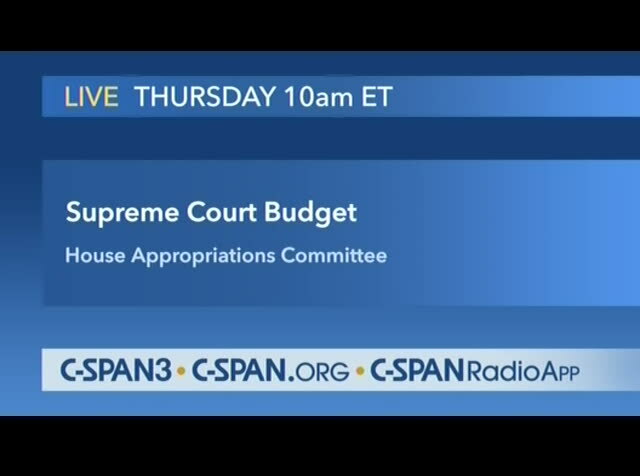 the justices will appear before house appropriations subcommittee. you can see this. 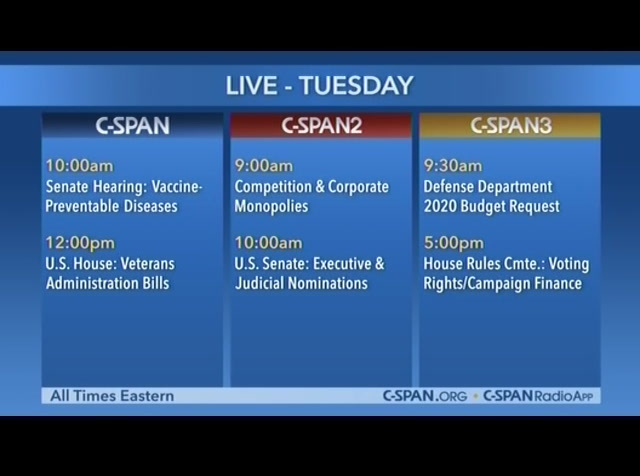 live at 10:00 eastern on c-span3, c-span.org and the free c-span radio apps. 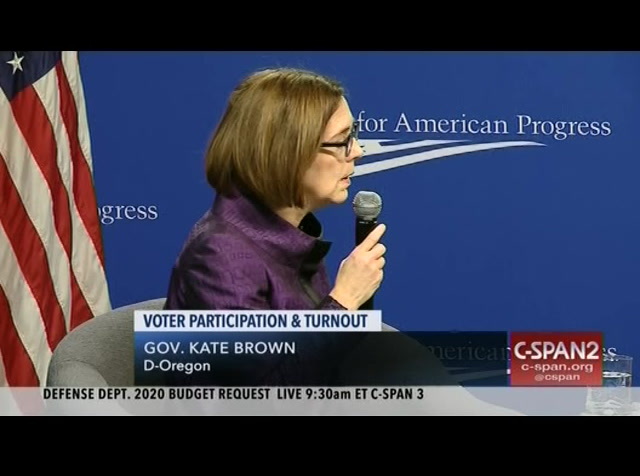 >> the next oregon governor, kate brown, on improving voter participation election security is head of the 2020 election. 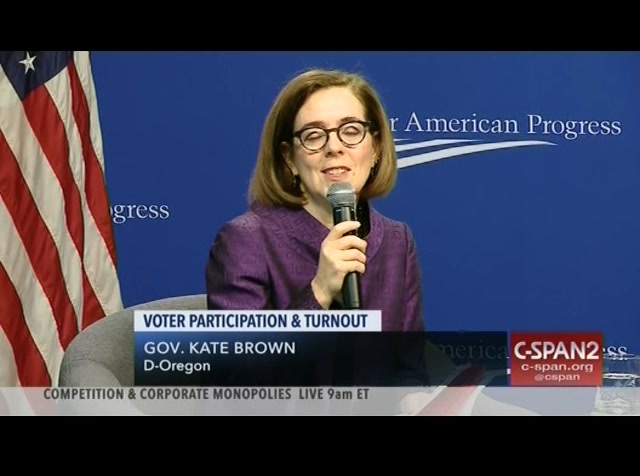 governor brown details her status i medical restoration program and vote by mail system. 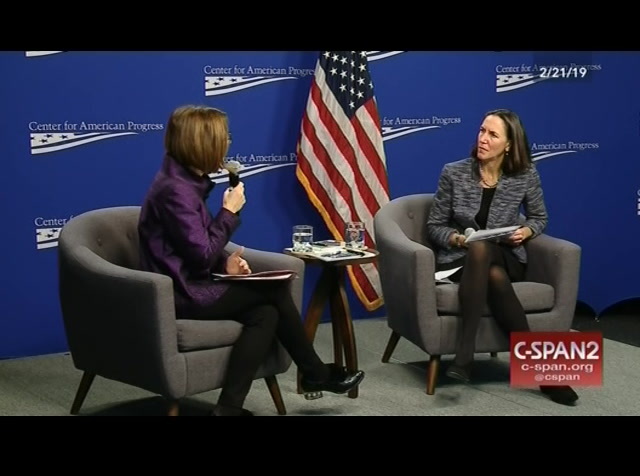 her remarks were part of an event hosted by the center for american progress. this is 50 minutes. 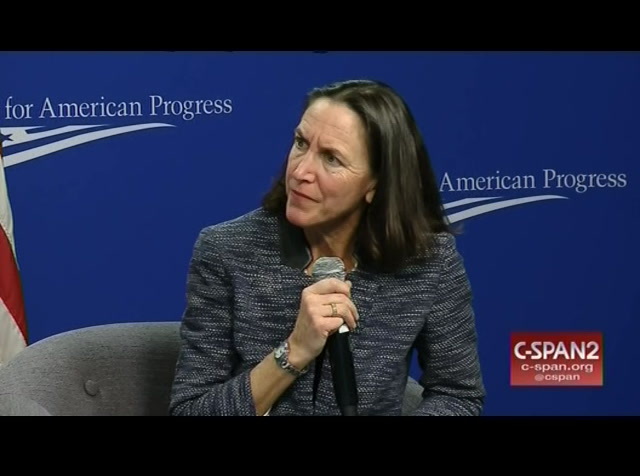 >> welcome to the center for american progress. today the fundamental right to vote is being attacked from all directions, whether district voter id laws, native americans and other community systematic with the voter purchase, gerrymandered districts and corrupt fair elections. to make matters worse, donald trump continues to spew baseless lies about voter fraud, failing to prioritize securing the elections against foreign interference. the department of justice made clear that it can no longer be relied upon, the right of eligible americans to participate in the democratic process. with headlines about north carolina's congressional district, those headlines are mindnumbing and a reminder for all of us about the work that needs to be done on elections. 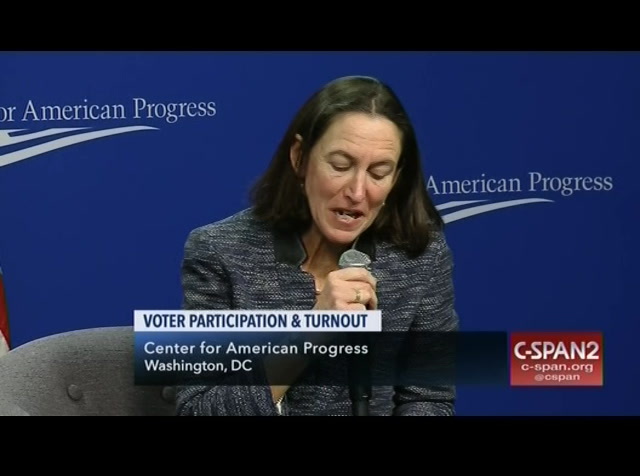 in the absence of leadership at the national level progressive champion at the state and local level are standing on the front lines of efforts to preserve and expand voting rights in america. under governor kate brown, our special guest for this morning, oregon has helped ensure that young people are seamlessly integrated into the electorate by implementing such reforms as automatic voter registration and free registration for 16-17-year-olds. 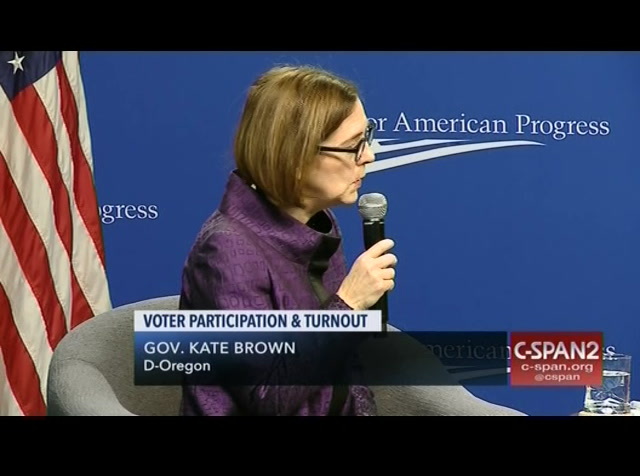 at the center for american progress and generation progress, proud to release a new report that highlights the successes of organ policies and empowering eligible young voters, during the 2018 midterm elections. 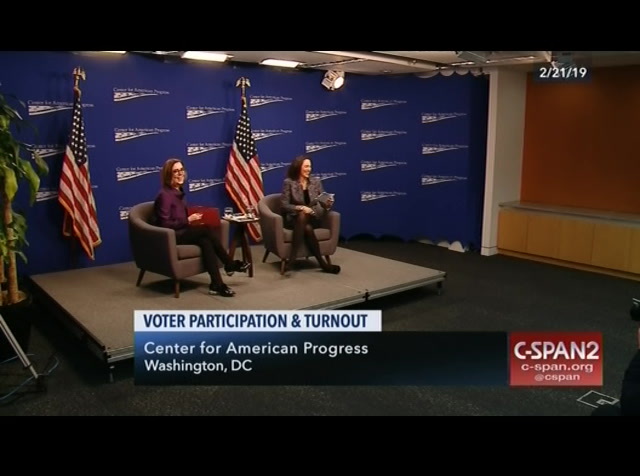 perspective voter participation nationally was at 47%. the question is what is the secret sauce? what is oregon's secret to having such high voter engagement in every election? 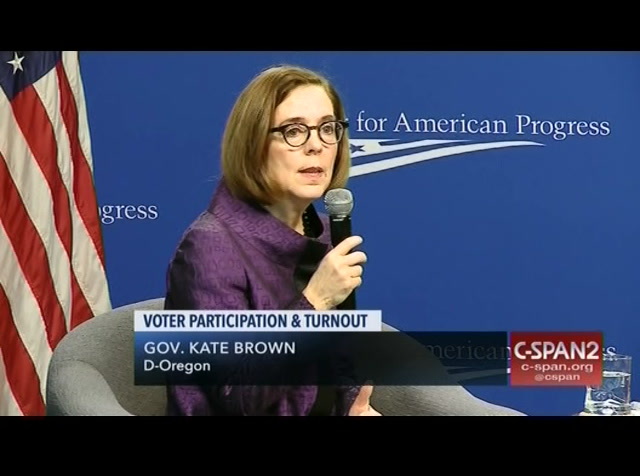 is it the result of policies that make registering to vote more accessible and just that oregonians are particularly enthusiastic about the electoral process or the candidate such as yourself are on the ballot? 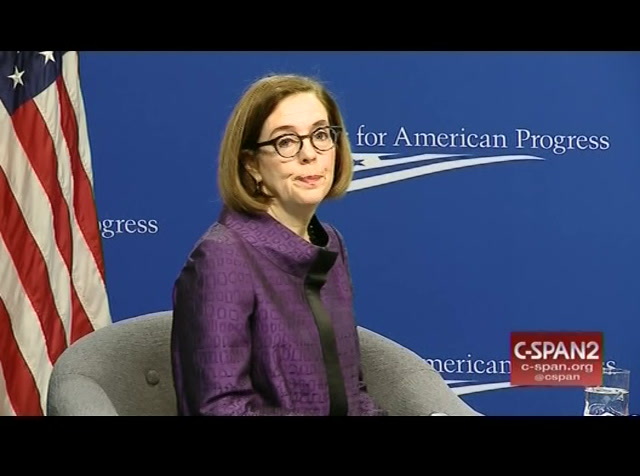 what is the secret sauce that makes oregon such a leader? >> there are so many things that i have to start with my story and this is a very personal issue for me. when i first ran for the legislature i ended up running against a 3 term incumbent. i was outspent 2-one. my team and i worked really hard. we knocked on doors multiple times, the reason i share the stories i literally won that race by 7 votes. 20 years later, i have people come to me and say -- governor brown, i was your seventh vote, the reason you won. everyone who voted for me, everyone who worked on my campaign believe they were the reason i won. they absolutely were. that combined ever truly made a difference. for me, it is personal. i'm living proof that every voice matters and every vote need to be counted. 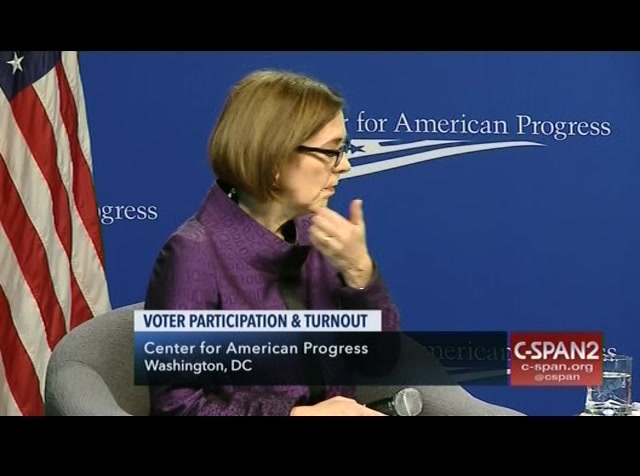 i am we made steady progress to make sure every eligible voter has access to the right to vote. it didn't start with me. i have really strong leadership prior to me. 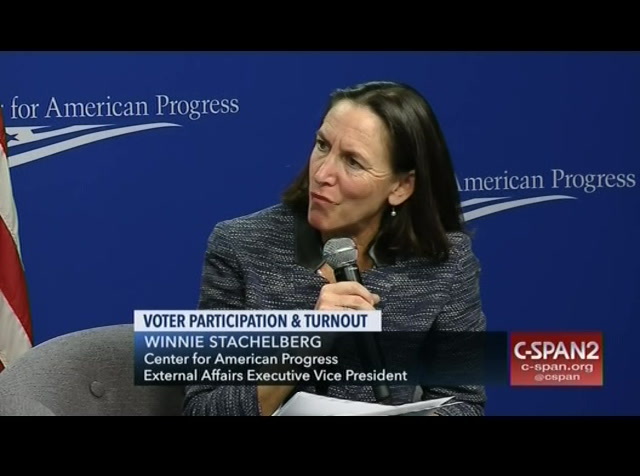 former secretaries of state led the effort to ensure that we could vote at home. otherwise known as vote by mail and that is extremely convenient and accessible for oregonians particularly young people with busy lives. 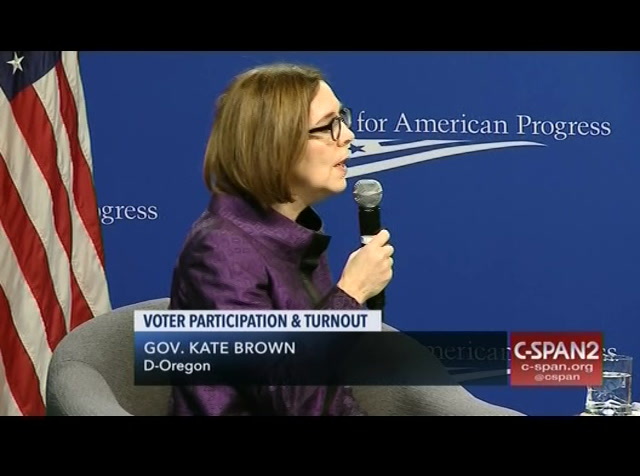 when i became secretary of state we move forward on online registration and it was in that platform that we used to develop our automatic voter registration system. 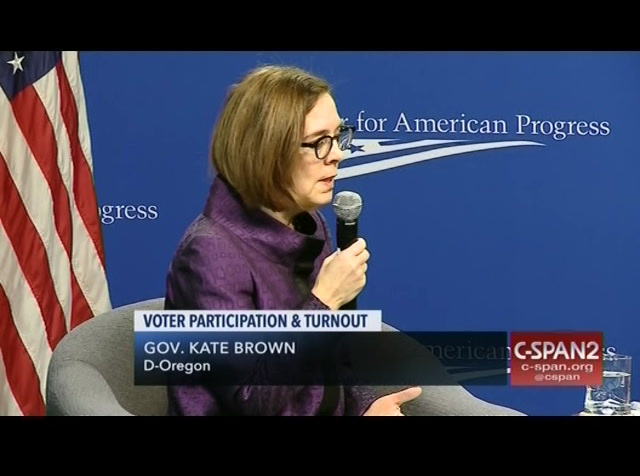 we were the first state in the country to automatic voter registration. we used the nudge principle meaning if an opt out, you are automatically registered unless you choose or take action to opt out. 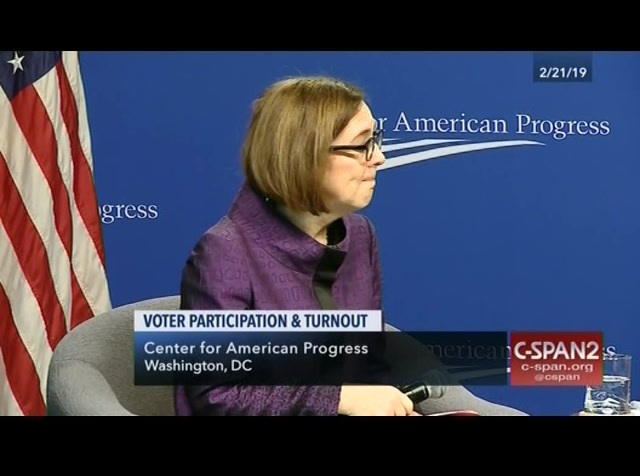 we now have as a result of those efforts, 90% of oregonians registered to vote in the state. 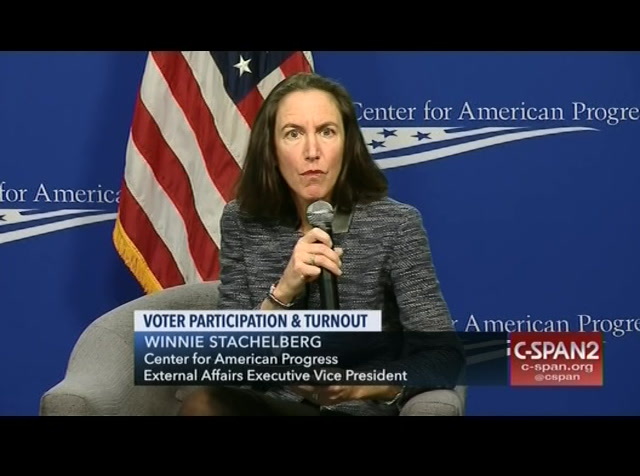 registering is the first hurdle we worked on to remove and the other is collaborative efforts to drive voter turnout and happy to talk about those. student association spent on voter registration that is being spent to educate, engage, and empower, a better use of people's time. i'm going to be talking to governors about it. i'm hoping governor comeau can use oregon as a model not only in terms of the automatic voter registration but also vote at home so new yorkers can literally get a ballot and in their post office, pick it up, fill out there ballot on time with family, filling it out at the kitchen table and stick it back in the post office and send it back, pretty simple and effective and secure. 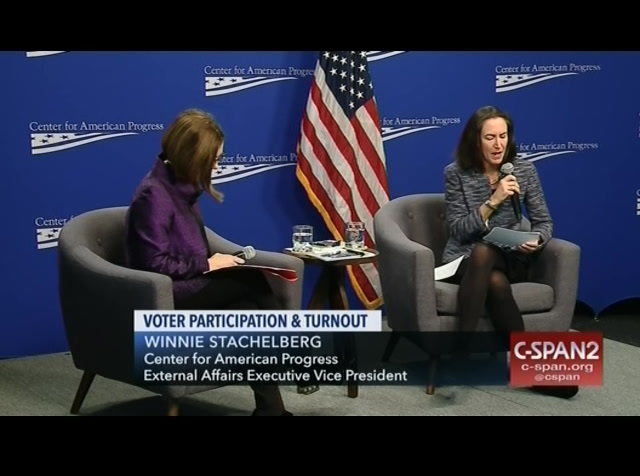 >> host: i want to talk about that but with shift gears and talk about young voters. 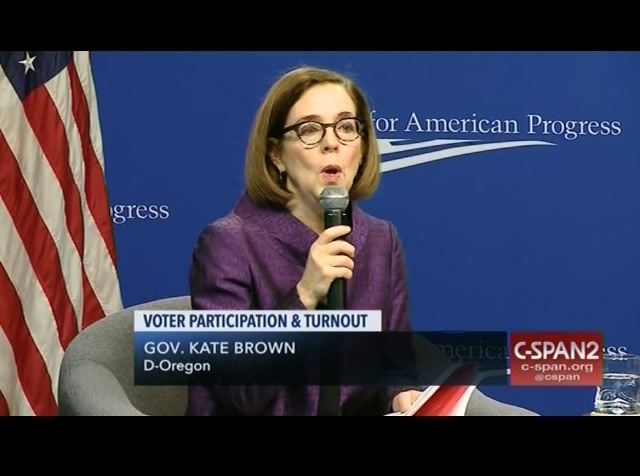 what is particularly impressive is how oregon has made the voting process more accessible is mentioned in opening remarks for the youngest voters. one of them. when your hand entering data that people sloppily sometimes -- i won't speak for others handwriting but certainly might have a hard time reading. it is an efficiency and cost savings measure. the reason why we are moving to other agencies in addition to that is particularly young people, a lot are not getting drivers licenses. 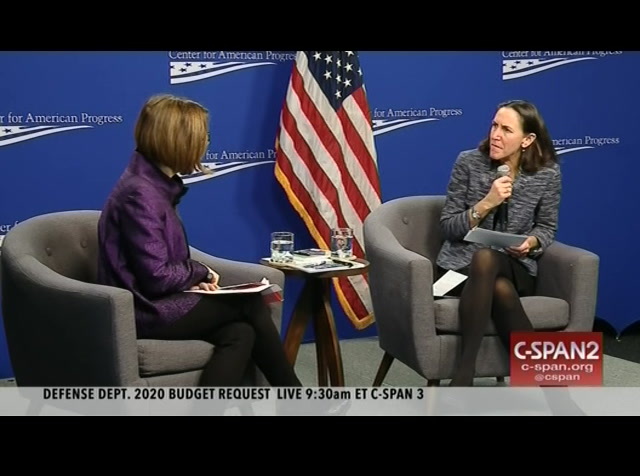 this is an opportunity to engage them in a different way and we are looking at university system and our department of veterans affairs to really engage voters where they are and ensure that it is a seamless system for them to participate. >> that is fantastic. that is one of the criticisms of these programs. and rural voters. 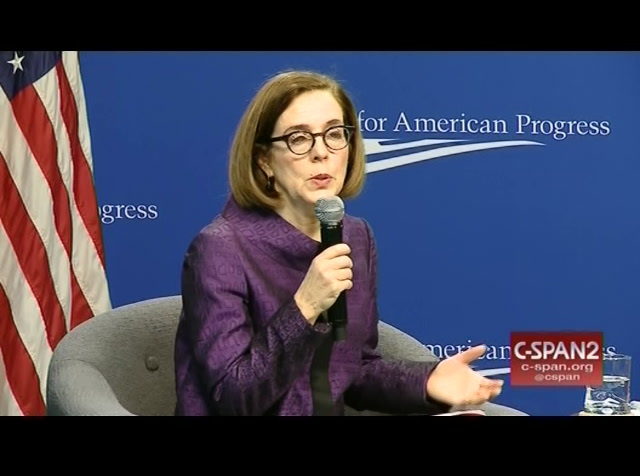 your proposed 2019 budget aims to improve on oregon's vote by mail system by providing free paid postage for every ballot. 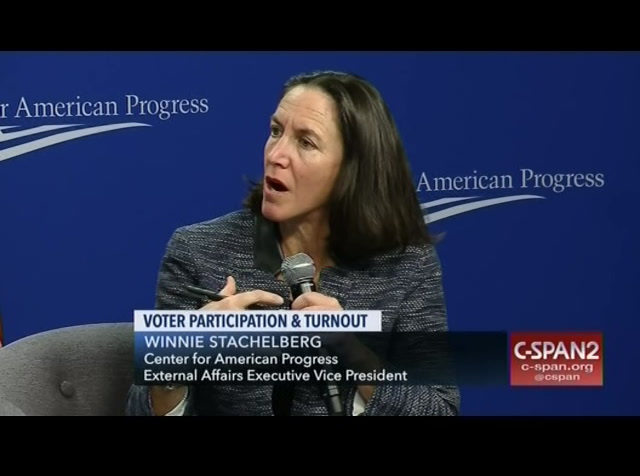 what drove you to propose this change and what impact do you think it will have on voter participation, voters experience overall? >> i want to share the story of a voter we met on the doorstep. >> one of your 7? >> guest: know. this is more easily than by 7. it was the 2016 election cycle. and knocking on doors to make sure the ballots, and the election cycle like everyone. our engagement team knocks on the door of a voter by the name of charles. and african american veteran of vietnam and korea, his commanders told him his voice didn't matter and there was no reason for him to go. rights. a couple million dollar cost for me in terms of elections, ensuring that every voice gets hurt, is absolutely priceless. 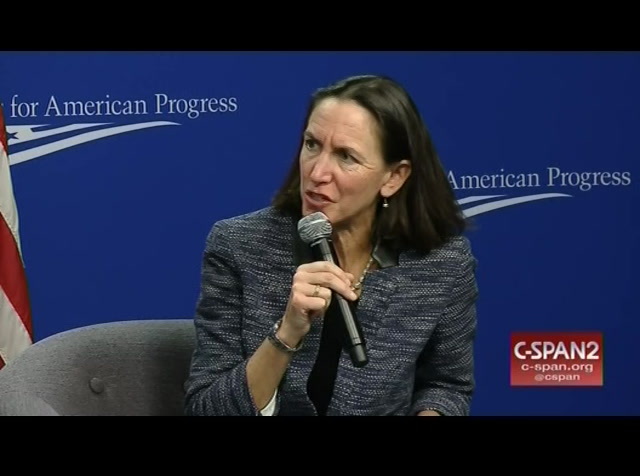 >> host: what is the response from the legislature as people look? .. we should remove every single barrier for people participating in this fundamental act. >> fantastic. republican-controlled legislature and our democratic governor vetoed it at the request of the dnc at the time. 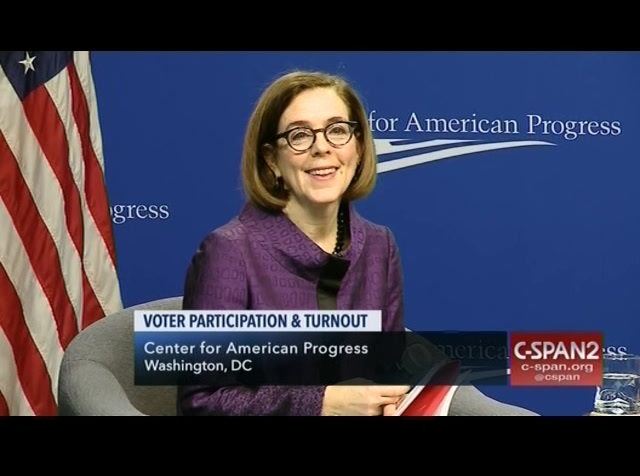 so our democratic secretary of state went to the ballot with an initiative and oregonians overwhelmingly supported it. it was culture change indefinitely. it is a secure system as voting at the polls. it is extremely cost effective. it saves 20-30%, and most important and most importantly it is convenient and accessible voters what you live in a do or can 203 or the city of portland. and so for me that makes it, it just makes it a really wonderful tool. i think there is pushed back around voted home, vote by mail. people say i miss standing in line and talking to my neighbors. absolutely, but do you know what's happening? people are having valid parties, discussion of the ballot. it comes out about two and a half, three weeks three weeks ahead of time along with a voters pamphlet with issue statements and candidate statements ahead of time. so people are having meetings in their neighborhoods, in their churches, in their synagogues, in their mosques about the ballot. and i think it's actually driving a higher level of engagement than frankly just standing in line because who wants to do that at this point? >> i sort of miss the standing in line thing. i go to my, the former elementary school and it is true, it is a community experience, but having those community experiences in your kitchens come in your houses of worship is also another wonderful way to generate community and interest in voting. that's fantastic. 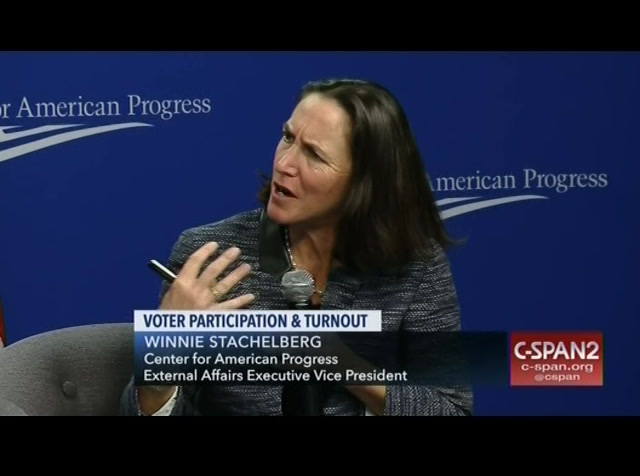 you mentioned security, sort of in relation to voting at all. 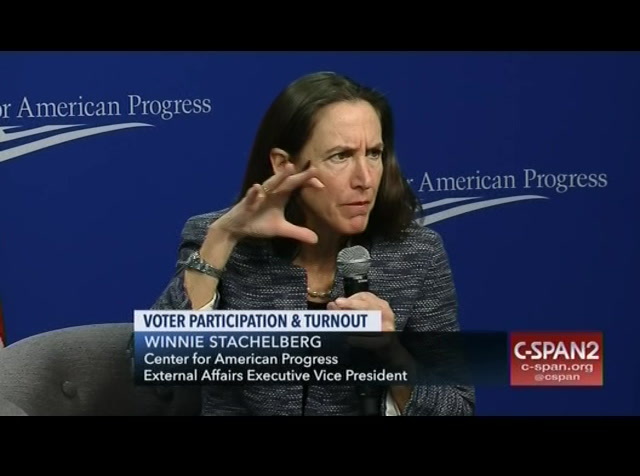 i want to talk to you about election interference by foreign and domestic adversaries. obviously major concern for elected officials and election officials and the public during the 2018 midterm election. 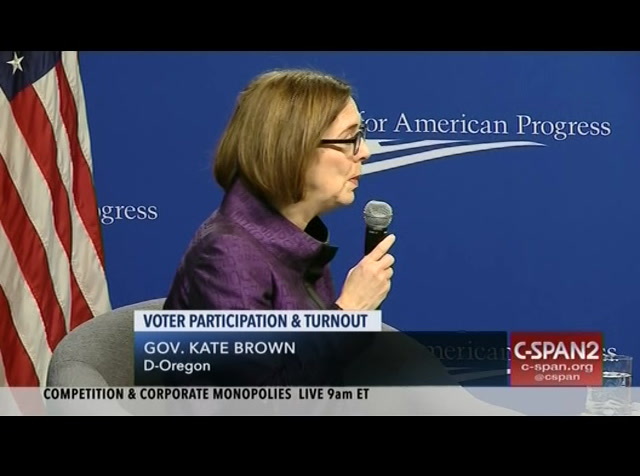 over the last two years we've seen a lot of improvements made to election infrastructure at the state and local level. 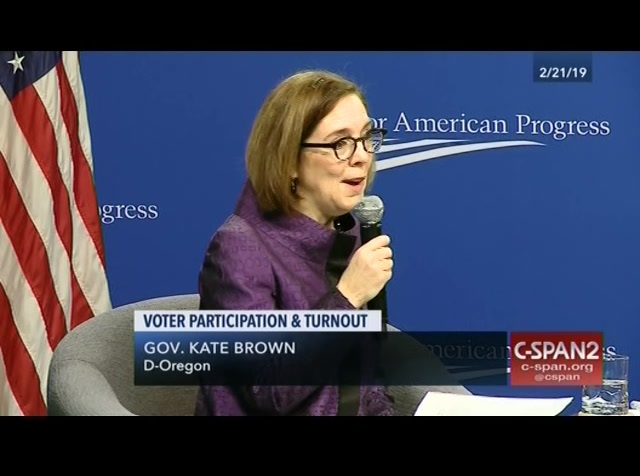 your state, oregon, ironnet cybersecurity expert to improve the overall -- hired a -- of the voter registration database but there seems to be a lack of urgency, no surprise you, at the federal level particularly from the current administration. 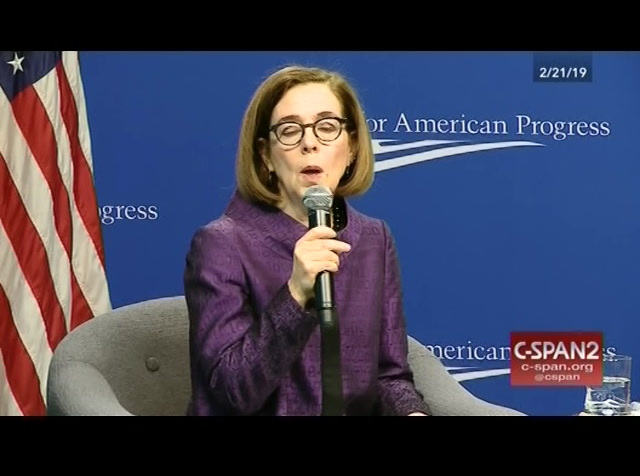 do you think the federal government has done enough to help prepare and secure oregon and other states from foreign interference from election meddling? >> absolutely not. and honestly i'm shocked there isn't more furor from americans on this issue. this is frankly the base of our democracy and we want to make sure that every single ballot, every single election is secure and has integra so -- integrity. i'm just appalled what's happening at the federal level which means nothing around the security and integrity of our elections. but i'm also frankly concerned about what's happening in communities around the entire nation. 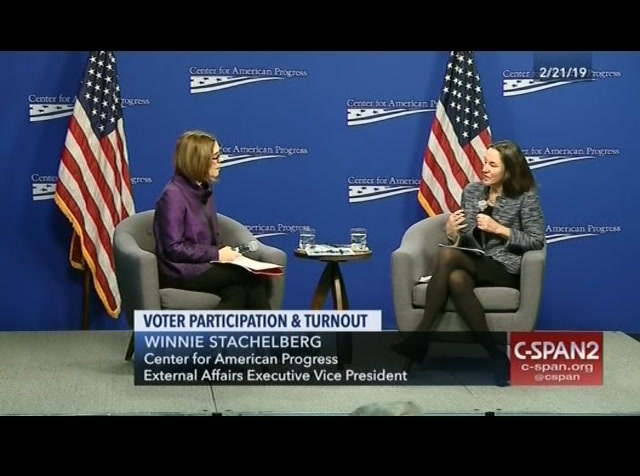 and after the war the bush election, our congress stood up and made a significant investment -- gore v. bush -- that was a lifetime ago honestly, and most communities are working with elections equipment that is out of date. it is, i know that machines, they don't even have the ability to fix some of these machines. adventure everyday americans don't feel as though their voices are being drowned out by big donors? >> let me just share one of my expenses, and oregon is one of five states in the country with absolutely no restrictions on campaign finance. so my opponent received at least $3 million from one donor. 2 million of that directly. and no one, no one should be able to buy a megaphone so loud that it drowns out all the other voices. 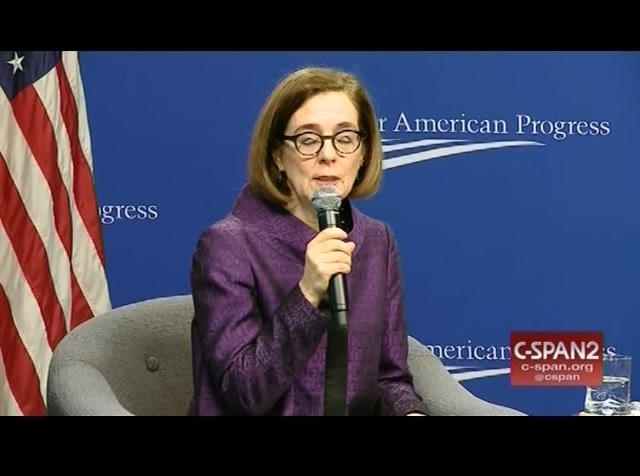 and so something that i've been working on in oregon for a number of years is bringing reasonable campaign finance limits to oregon that will require a constitutional amendment because of a court ruling in 1997. so we are very committed to ensuring that we can get that done and put it up to the voters as a constitutional amendment. our voters will need to pass it. students the data. it's really clear. in 2008 we saw that we had a relatively grand student voter turnout, then in 2009 we saw a direct correlation with the legislature putting significant resources into our university system to ensure that students of all income levels could attend. and so we are able to show these direct data points to students, and that really makes a difference. 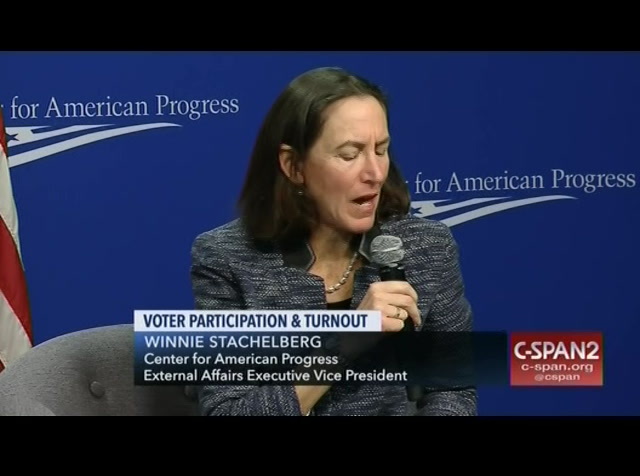 but i tell them when, over the age of 65, if 90% of people vote, who are elected officials going to listen to? people over the age of 65, right? and so if we could get 90% of students under the age of 30 or 25 voting, it will absolutely change the policies that elected officials are focused on. >> so true. 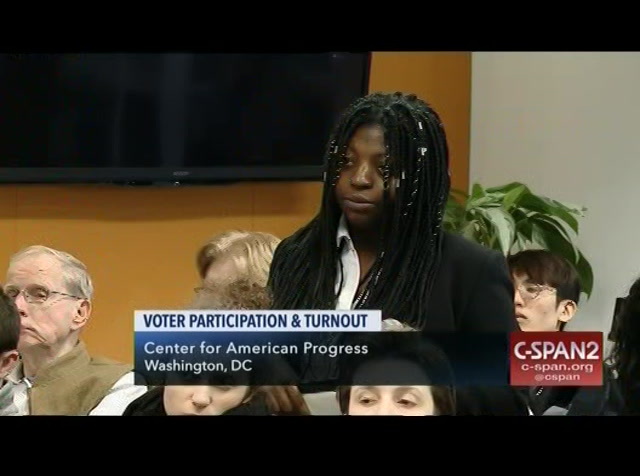 i think we have a student from howard university in the audience who has a question to ask. >> hello. i attend howard university in d.c., and last year, this year's midterm election i was -- last years midterm elections are supposed to vote for the first election and i would be the first one i would be voting in. as a freshman student at howard university i still call ohio my home so i requested an absentee ballot from out-of-state. i was told the patient and keep track of my ballot tracking the online system. i waited and waited and my ballot never came. the system i was asked reliant failed. and like some others voting absentee i missed my first midterm election. i was eligible to vote in. 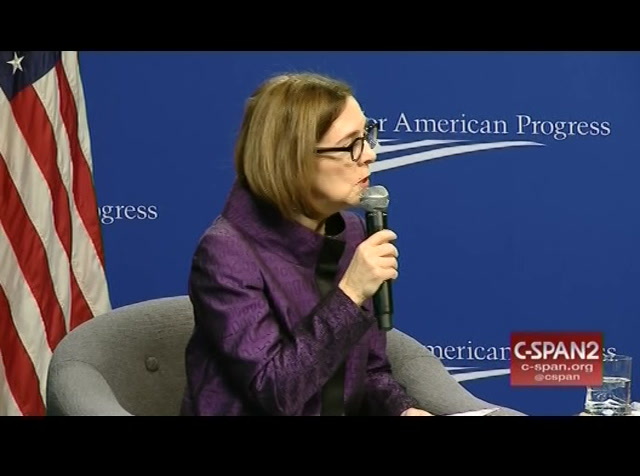 what are some solutions that can implement it at the state or national level to promote young people to prevent young people from going through the situation once again? just essential policy positions for so many of these critical issues. >> absolutely. if you look at what's happened across the united states him and i'll pick on texas and north carolina. texas, the law passed, a voter registration law, that prohibited use of a student id as id for voting, which i find absolutely appalling. in north carolina there were so many things that happened there. these are because we are, as in the united states, electing people who are specifically restricting access to the ballot. 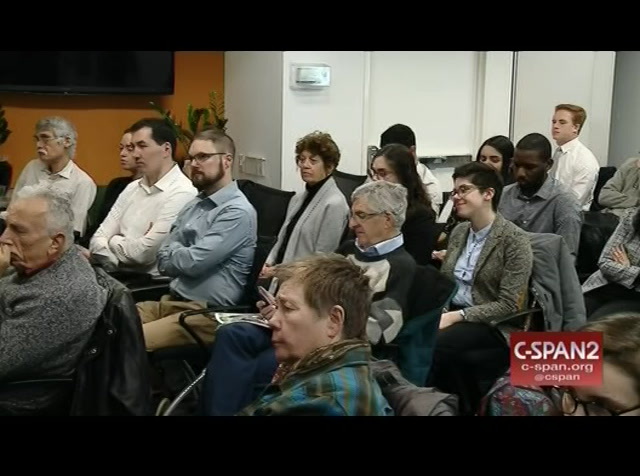 and they are doing it conscientiously and very, very explicitly to young people, to people of color, to low income people come to our seniors. 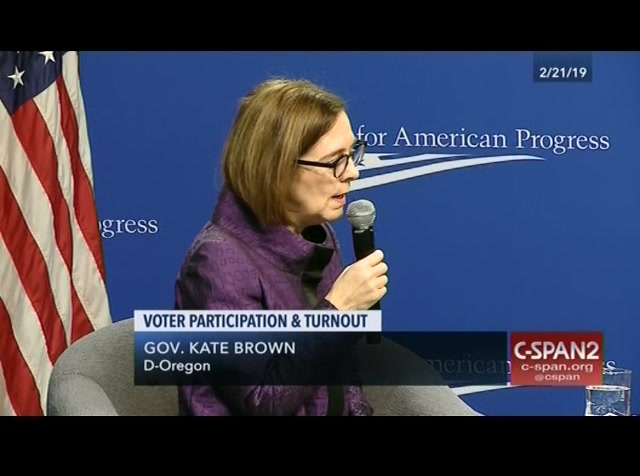 there is, it's been a tan, obsolete to decade effort to restrict access to the ballot, and where to stand up and we have to fight against it every step of the way, including our secretaries of state. [applause] >> absolutely. a question appeared in the front, adam. -- up here. >> thank you for all of your efforts. 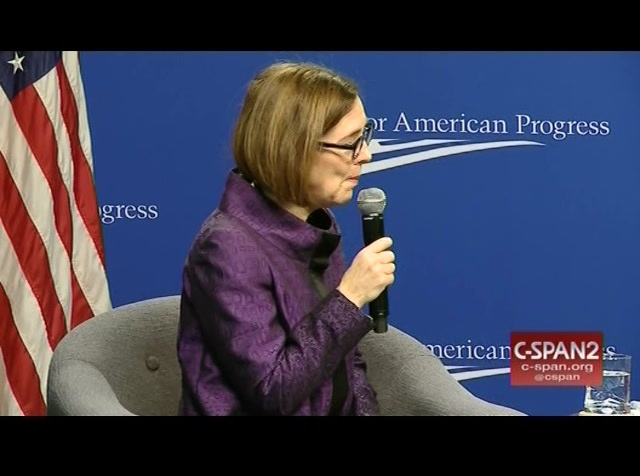 i'm interested in knowing when you get out of the washington d.c. bubble and go to states like oregon, wisconsin, nevada, local news media, whether their local radio stations, local tv stations and campus newspapers are actually quite important within the states, more so than cnn or fox news. people watch those things and listen. so what was the activity in your local media disperse across the board to these efforts of yours? 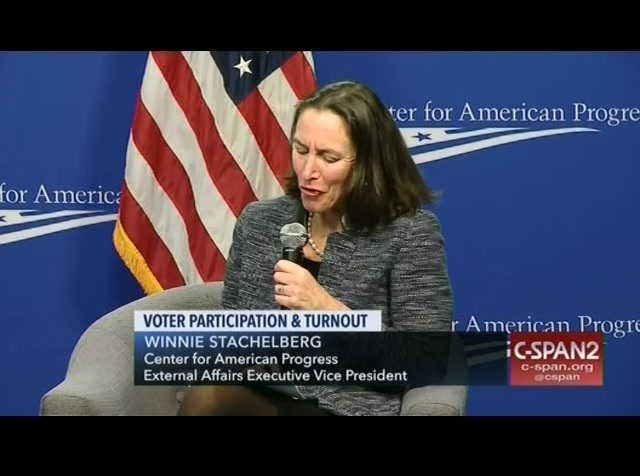 >> to the automatic voter registration? well, i have to be upfront with you. first of all, it took a multi-your effort your effort. i started in 2013 when i was secretary of state. 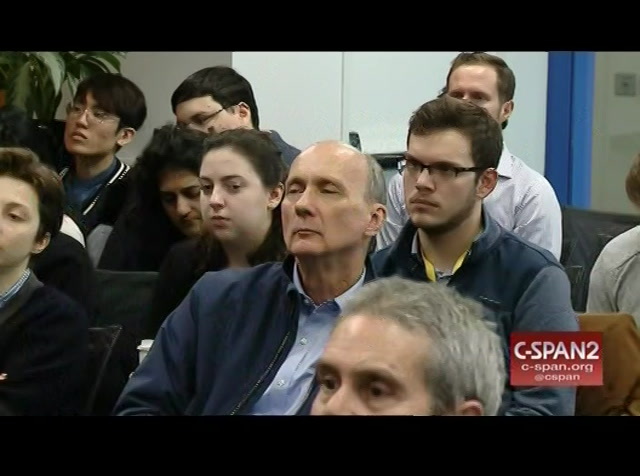 >> here's some of our live coverage tuesday. 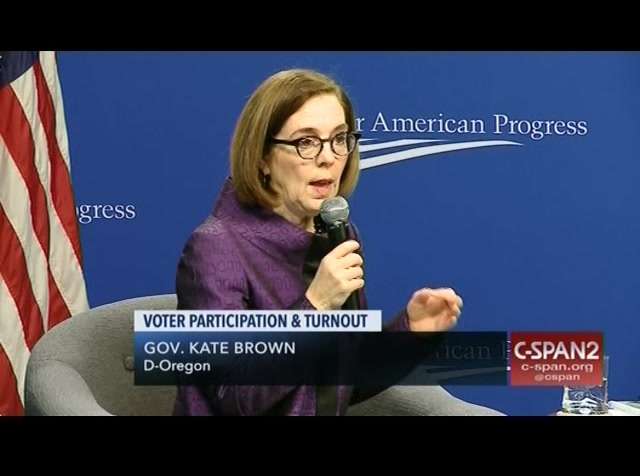 Oregon Governor Kate Brown (D) discussed efforts to improve voter participation and election security ahead of the 2020 election at an event hosted by the Center for American Progress. 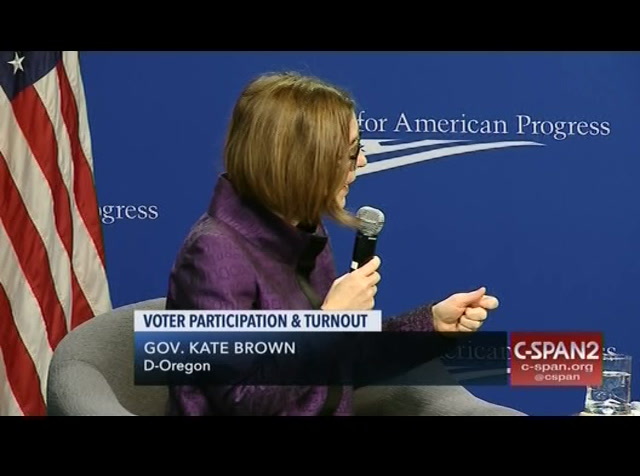 More specifically, she detailed her state's automatic voter registration program and vote by mail system. Gov. Brown also addressed campaign finance, voting rights and efforts to increase youth and minority voter turnout. 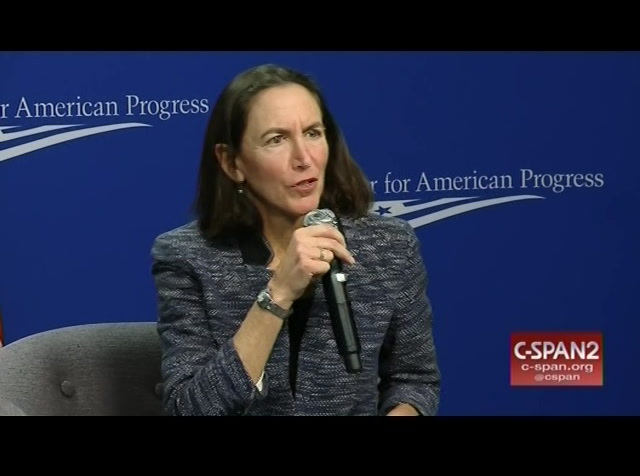 Center for American Progress Executive Vice President Winnie Stachelberg moderated the event.